The newspapers and airwaves are filled with discussions regarding President Obama's overall performance. "President Barack Obama’s job approval has reached an all-time low in the polling of NBC News and the Wall Street Journal, one of the major media surveys conducted by a bipartisan pair of experts. Just 42 percent of Americans approve, they report today. In polling parlance, Obama is “upside down,” with 51 percent disapproving. This is down from a peak of 61 percent approval in April 2009, by the NBC/Journal count. ", October 31, 2013 Obama’s ‘Tanking’ Approval — Where, Actually, is the Floor? As these ratings fall most of the discussion relates to the implementation of Obamacare, spying on leaders of our allies by the NSA, leaks by Snowden regarding the spying on American citizens, how the crisis in Syria is being handled, the shutdown of the government and the debt ceiling crisis. Barack Obama is President and the buck stops at his desk. Others in Washington are obstructing progress and it is worthwhile to access how much of the problems have been exasperated by the actions of Congress and what are their intentions. Shortly before the Presidential election in November 2008 the economy collapsed and we came very close to falling into a depression the size of which would have rivaled the 1930's. Unlike the 1930's, this time our government acted prior to a total collapse rather than after the fact like in the early 20th century. Averting the depression occurred because banks and other financial institutions were propped up by an infusion of capital by the government in excess of $1 trillion dollars. The Bush administration deserves credit for this decision. The crisis was overwhelming and was exasperated by Obama's lack of experience. The near depression occurred simultaneously with the collapse of the auto industry which was temporarily propped up by the federal government waiting for a more permanent solution from the new administration taking office in January 2009. In addition to Obama winning the Presidency, in 2008 the Democrats also won control of both the house and senate and the party decided it was time to pass legislation for universal health care, now known as Obamacare. Ignoring whether you believe the nation should provide universal healthcare, the timing of its introduction was terrible. We were in the midst of fighting off an economic disaster and we did not need the additional distraction that, if passed, would further increase the cost of running the government. Although never spoken, I believe many Democrats were partially motivated by Ted Kennedy's death at this time as he was the champion of universal health care in the senate for decades and they wanted health care to be part of his legacy. I support some kind of national, government supported, health care plan but we should have waited to implement it. Further, the industry is controlled by an oligopoly and is not a free market. The first thing the government should have done is enforce anti trust laws to make it more competitive and thus drive down the price. If the industry cannot be made more competitive it should be further regulated; but first free markets deserved a chance. The first Presidential election I voted in was 1968 and I have never witnessed such dysfunction in Washington as we have today. For our representatives, the issue is not what is best for the country, but what is best for them personally including financially. This is true on both sides of the isle however it seems more pronounced on the Republican side. I was hoping this would change with the appearance of the Tea Party, however they too seem to have been bought off, at least on the national level. Is this the reason why we send representatives to Washington; to disrupt and defeat the President that was elected under the terms in the Constitution? I thought we wanted them to follow what President Eisenhower said in 1961 in his farewell address to the nation. "Our people expect their President and the Congress to find essential agreement on issues of great moment, the wise resolution of which will better shape the future of the Nation." Surely Congress deserves much of the blame for our governments dysfunction. After all, they are charged with the duty of writing laws and paying our bills. This has been going on since the beginning of time but listening in on the leader's phone conversations is going too far and should stop. Shame on President Obama for allowing this. Do not forget our spying capabilities are also used to defend our allies from terrorist attacks and I am sure they agree that should continue. The President is handling it well. The process was sloppy but so far it has produced good results. No Americans were sent into combat, Syria is destroying their chemical weapons and we have minimized the use of our resources to accomplish this. Those who make their living by being a part of our huge military/industrial complex are complaining because they see their influence waning. Many of our nations generals are upset and dissatisfied with Obama's performance. Do you think his desire to cut back on defense spending may be part of the reason? They will lose both power and income. It is time we stop being the army of the entire free world. Our total defense budget exceeds the total of the next 13 largest budgets in the world and many of those 13 are allies. China's budget is only 20% of ours. Congress has refused to do significant investing in infrastructure, education, research and development that would reduce unemployment and allow us to better compete in the future. Many argue we must reduce debt first. This, despite the fact that our debt relative to GDP has been drastically reduced from its peak in 2009 as shown by the chart on the left. Yes, the Tea Party is correct we do need to get a better handle on our debt, but it must be done in an orderly well thought out fashion. 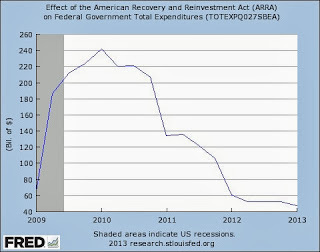 In addition the original stimulus package in 2009 has been flushed through the economy. Sometimes reality trumps misinformed beliefs. The 2009 stimulus did not become a permanent part of our budget. We should be investing more for the sake of our future. In the year 2000 65% of worldwide middle class consumption was done by citizens living in Europe, United States and Japan. By the year 2030 the percentage of middle class consumption in these countries is expected to fall to approximately 15% of the total. Over the same time period, the percentage of middle class consumption in the United States alone is expected to fall from 23% to around 5%. Further, We have the time to get better control over our debt by simply doing it over a 15 to 20 year time frame rather than getting very austere and doing it in a 5 to 10 year time frame. China and the rest of the world will not wait for us. We do not need to surrender our position in the world. This is no different than a family deciding to refinance their house so they can afford to send their kids to college. They know in the long run the family will be better off. We cannot afford delaying to invest in our future. If we do we will fall further behind. The President is right in wanting to invest in the future. 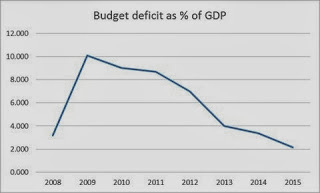 It is a fallacy to think we are helping future generations by recklessly slashing the federal deficit. Some of the funds needed can be extracted from other parts of our federal budget, most notably our defense budget. They should be diverted to the greatest asset we have, the education of our children. The President has his priorities right on investing in the future. The slash and burn budgeting process of Congress has it wrong. It will hurt our future, not help it. This fiasco belongs to Congress with little contribution from the White House. Obama's contribution is he should have been more aggressive all along to get a budget agreement. He let Congress control the issue. His lack of experience and no relationship with members of congress cost us. Eventually he gave up on them. That is not acceptable. We have a government that does not work and we the people deserve much of the blame for letting it happen. We need to be more active and make demands on our representatives to represent. We seem to be accepting the fact that money rules. Yes, we complain and then we move on. Here is what we should be doing. 1. Reverse Citizens United with an amendment to the constitution. 2. Allow a President to only be in office for one six year term. 3. Prohibit a department head in the federal government from working for anyone in the industry which he/she is regulating for seven years after leaving government. 4. Create a tax payer based method to finance election campaigns. Our democracy is in the balance.